Summer is just around the corner. Have you been dreaming about the warm, sunny afternoons you plan to spend in your backyard? You want your outdoor space to be a place you go to relax, unwind and decompress. We have seen some of the best landscapes in the Pacific Northwest. That’s why your landscaping experts in the greater Seattle area are counting down our top 10 backyard tips to dress up your space this summer. We have scoured the internet for the latest outdoor design trends for the Pacific Northwest. Not everyone in the Seattle area has a huge yard to enjoy, but even small spaces can be refreshed and modernized with our frugal ideas. In Part 1, follow our creative trail as we provide 5 easy and affordable options to take your outdoor space to the next level. 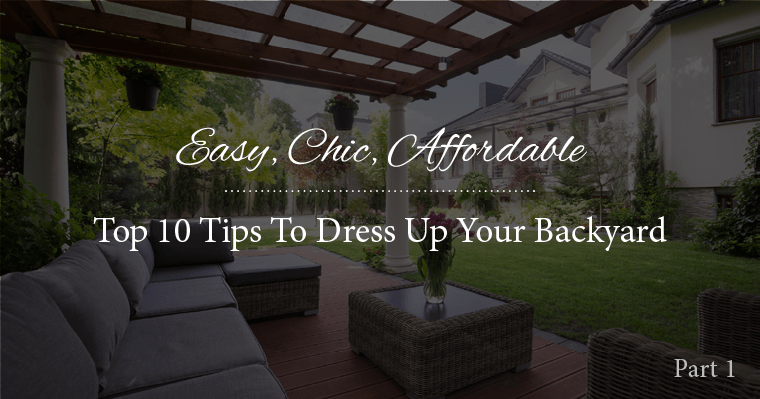 For our top 5 landscaping ideas, read Part 2 of Easy, Chic, Affordable: Top 10 Tips To Dress Up Your Backyard. Upgrading your landscaping, patio or deck doesn’t have to be time-consuming or expensive. In fact, some of our recommendations may actually cut down on your produce expenses! We hope our budget-friendly ideas to upcycle or recycle items will freshen up your space for the summer. With 35 years of experience in everything tree-related, landscaping, all the way to roof repair and gutter cleaning, we are your best choice to make your summer backyard a paradise. We can help you with those major and minor details to keep your yard looking great all summer. Contact us for a free estimate or call us at 425-844-9923. Have any other economical options to upgrade your Pacific Northwest space? We’d love to hear about them!